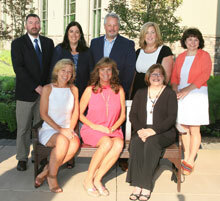 The volunteer board currently consists of nine individuals with varying backgrounds. Many of the current individuals serving are original trustees associated with the formation of the school. Parents of current students are represented as part of the school’s Board of Trustees. Board meetings are held twice each month, generally on the first Thursday and third Monday. Please check the school's web site or call the School office to confirm specific dates. The meetings generally begin at 6:00 p.m. and are held at the school. The meetings are open to the public and parents, faculty, and staff are encouraged to attend. If you need special accommodation or assistance, please contact the Main Office at (570) 820-4070, extension 0. You many contact the Board of Trustees via email. Front Row, Left to Right: Brandy Lewis, Kim Popple, and Wendy Lutchko.